and the rather larger Manager's House (now 'Rose Villa' No 39 Cambridge Road) on the right. The old Brewery building can be glimpsed in the upper right corner. Compare this with the Cundall's publicity image below. Philip and Arthur Hugh Meyer. J & J E Phillips Ltd., Royston Brewers. Cundall (Orwell) Folding Machine Co Ltd.
Cundall's Munitions Works, Government Controlled Factory (War Work). Sale of the "Oatlands"/"Orwell Grange" Estate. 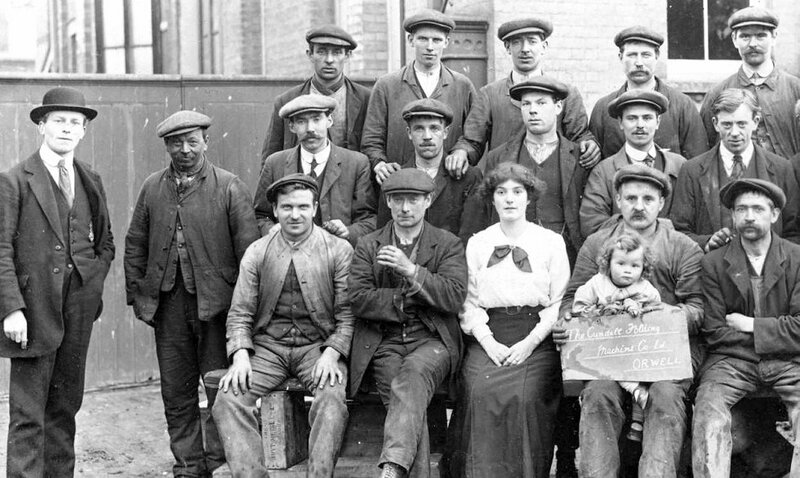 Three photographs: Cundall's Workers. Three Photographs: War Work. "The Meyerses at the "Hardwicke Arms" used to brew their own beer; and rattling good beer it was. We used to say that the water from their horse pond brewed the best beer in the county. My uncle [Lord Hardwicke] too used to brew his own table-beer, and that for the Rent Dinner. All through the winter he insisted on a Loving Cup of hot spiced ale being served, and drunk with the usual ceremonies, at his table. 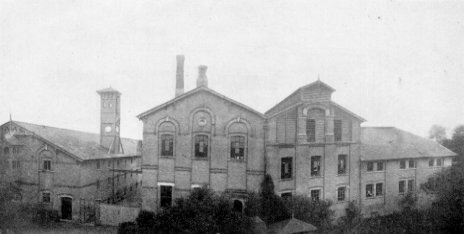 The brewery at New Wimpole was not built until after 1873. It was built, so it is said, because my uncle had rowed with them for using the "Hardwicke Arms" as a private residence and not as an Inn." - Alexander Campbell Yorke in 'Wimpole As I Knew It'. For nearly fifty years, there was a large industrial building located behind houses 15 to 39 on the south side of Cambridge Road, New Orwell [now Wimpole]. The land was purchased in late December 1874 by the Arrington brewers Philip Meyer and Arthur Hugh Meyer (perhaps partly) by an indenture charged with the "payment of an annuity of £20 to Henry John White and Elizabeth his wife during their lives and to the survivor during his or her life". The building work for the new malthouse and brewery (the 'Orwell Brewery') was completed c1876. It is likely the buildings were constructed from bricks from the local Wimpole brickworks, which was located on Cambridge Road some 400m to the west. It was said the brewery was built following the Meyers' falling-out with Lord Hardwicke and a desire on the Meyer brothers to move outside his estate and control. A complementary explanation was that their Mother Hannah died in 1872 and left Philip and Arthur an inheritance of some £6000 (nearly £500k in today's money), with probate granted in 1873. The timing fits perfectly and the inheritance would have been sufficient in those days to enable her brewer sons to buy the land the following year and to commence the building of their new brewery. The Meyers also built a terrace of seven cottages for their new employees fronting onto Cambridge Road, plus two detached houses (one for their Works Manager and and a smaller one for the Foreman - see photograph at the top of the page). They also built 'Oatlands', their "imposing" residence at the rear of the brewery. The brewery cottages are the taller buildings to the right. Seven front doors. at least the 1830s and thus predating the construction of the Meyer's brewery]. They were not included in the 1921 and 1922 Auctions. Note the factory chimney and 'clock tower' over the cottage rooftops. The main works entrance to the (by then) J & J.E Phillips brewery was just beyond the far end of the row. On 1st December 1897 the Meyer brothers formally retired as brewers, selling the freehold title to the estate to Royston brewers John Phillips and Joseph Edward John Phillips (trading as J & J E Phillips Ltd). Some accommodation must have been agreed because the Meyers bothers and their tied tenants were still in residence at the 1901 Census. Brewing at the 'New Orwell' complex ceased completely a decade later and in 1908 Messrs J & J E Phillips Ltd leased the buildings to William Denton Cundall and the 'Orwell Iron Foundry' and 'Cundall (Orwell) Folding Machine Co Ltd', which made paper folding machinery. 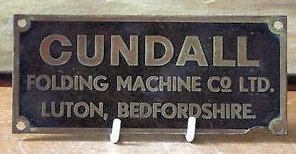 The new folding machinery company was a break-away away from 'Cundall, Sons & Co Ltd.' (1904-1908) who traded in Shipley, Yorkshire, and it transferred south under the sole ownership of 'son' William Denton Cundall. A number of the Shipley employees came south with him. The promotional article below gives a 'conducted tour' of the new factory premises. The 1911 Census for 'New Orwell' lists 36 men, women and children either born or living in Yorkshire. I have included in that figure the Cundall family, two Orwell-born infants having two Yorkshire-born parents and one American-born British subject previously living and working in Yorkshire. See Yorkshire Families below. 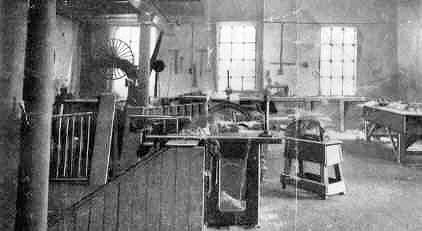 Following the outbreak of the First World War in 1914, part of the Cundall's factory became a Government controlled munitions works. I have a contemporary printed reference to the "Cundall Munitions Works" but this may have been just a casual description. 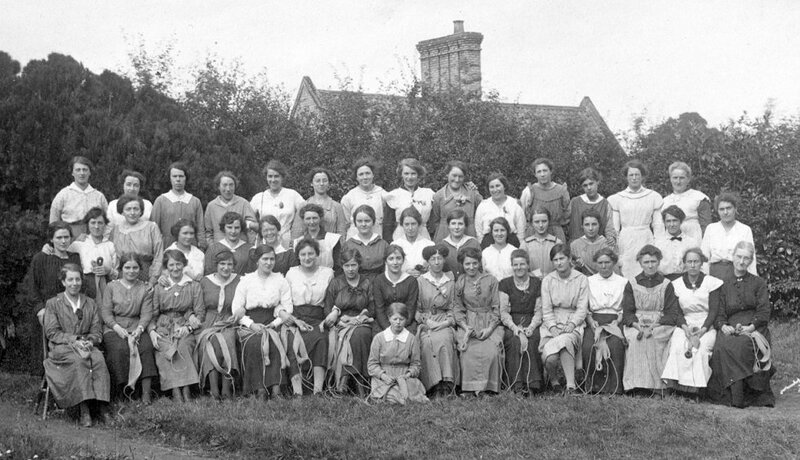 Although the manufacture of paper-folding machinery appears to have continued for several years, over 50 local women were employed to sew military webbing, harnesses and parachutes [the last linked to "W. Holmes and Son Ltd., Orwell"]. At some point the Cundall factory re-located to Luton and traded until the late 1980s or early 1990s from an address in Cobden Street. During WW2, the company made parts for Mosquito aircraft. By 1966 the company had been absorbed into the Printing Machinery Group (believed to be part of Vickers). J & J E Phillips Ltd sold the freehold title of the Orwell factory and estate to Charles Townley on the 15 June 1917 but as the First World War finished, the buildings fell into disuse. Although Townley considered the construction of four semi-detached houses on Cambridge Road, only one pair had been completed at his death in 1920 (present-day 45 and 47 Cambridge Road). After his death, the freehold of the estate was ordered to be sold by Auction to meet the outstanding mortgage liabilities of £3000.00 plus interest. The first Auction, held on Tuesday 27 September 1921, included "'Oatlands' (also variously known as "The Grange" or "Orwell Grange"), the empty Brewery/Cundall's Factory building, a Forge/Smithy, a thirty acre field, and seven domestic properties fronting Cambridge Road". The first Auction was unsuccessful, so the main brewery/factory building was demolished and cleared away before the second (successful) Auction and the resulting sale in 1922 to Captain Richard George Briscoe MC (1893-1957), later Member of Parliament for Cambridgeshire from 1923 to 1945. Captain Briscoe was a British soldier who, as a 2nd Lieutenant, was awarded the Military Cross in WW1 for carrying a message after a sniper had killed two runners. 'Orwell Grange', the worker's cottages (I live in two of them!) and the 'Manager's House' ('Rose Villa', 39 Cambridge Road) all survived the demolition. This brief introduction ends with six related photographs - three showing Cundall foundry workers and three showing WW1 photographs of the women from Wimpole, Orwell and Arrington employed on war work. Click/tap for larger images. Click/tap for larger images (or just scroll down to the bottom of this page). 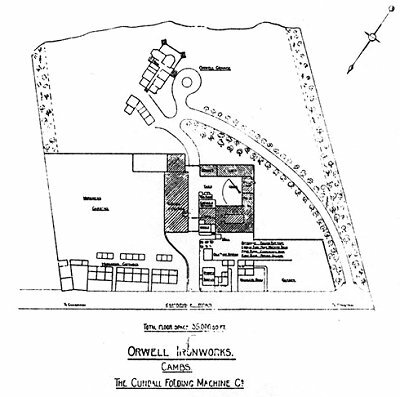 I also refer you to David Miller's general history of the Oatlands/Orwell Grange estate (on the 'Orwell Past and Present' website) which has helped with some of the above chronology. Some of the auction sale documents and estate plans can be viewed on the same page. David's page also provides us with our postscript that "local historian Dr Shirley Wittering has informed us that a cottage in Thriplow called Sunny Peak cottage was built with bricks from the demolished factory building." William Dunton Cundall was born in Thornton, near Bradford, in 1864, son of Robert Cundall (1830-1866) and Elizabeth Denton (1832-1918). He lost his father when aged 2. Co-author of patents relating to improvements on Hydrocarbon Engine (1896 and 1903). 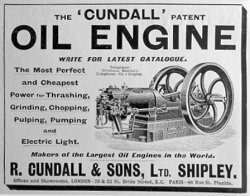 Family business R Cundall & Sons (renamed Cundall, Sons, & Co in 1904 then Cundall Gas and Oil Engine Co in 1908 when William left). He married Kathleen Jackson (1870-1930) in 1901 and they had two daughters, Joan Burton Cundall in 1903 and Eileen Denton Cundall in 1905. 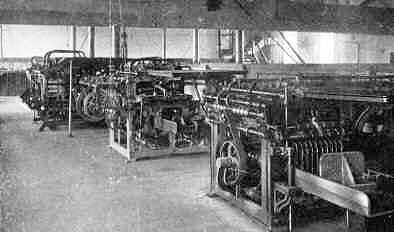 He was the sole proprietor of the 'Cundall (Orwell) Folding Machine Co Ltd' established in 'New Orwell' from 1908. Re-established in Luton, Bedfordshire c1917. William Denton Cundall died June 1939 in Knaresborough, Yorkshire, aged 74. The following promotional article appeared in the October 1909 edition of the "British Empire Paper, Stationery & Printing Trades' Journal". Think of it as an advert. The article and two Cundall product catalogues were kindly lent by Joy Miller of Orwell in 2002. [This is a distorted view made from various photographs stitched together. "At the kind invitation of Mr William Denton Cundall, who, as we announced in a recent issue, has acquired the whole of the business relating to folding machines hitherto carried on by Messrs Cundall, Sons & Co Ltd at Shipley, Yorkshire, of which branch he had had control for many years, we have had the pleasure of paying a week-end visit to his new works, and to his beautiful home at Orwell, Cambridgeshire. Here he is in possession of one of the most up-to-date works that could possibly be found for the production of the machines which have made a name for themselves throughout the world. "Feeling that there are many of our readers who would be interested in a short description of the method of manufacture of machines with which they are in daily contact, we had not the slightest hesitation in accepting Mr Cundall's invitation, so we might see for ourselves how these really marvellous pieces of mechanism were constructed, and, to the best of our ability, to transmit our impressions into cold type, assisted by the camera and the blockmaker." "The new works of the Cundall Folding Machine Co., under which name the business is worked (Mr W D Cundall being the sole proprietor), are situate on the main Roman road running from Cambridge to the West, about one-and -a-quarter miles from its juncture with the Old North Road (formerly known as Ermine Street). The works themselves lie back from the road about 80 to 100 feet, and are approached by a wide roadway lying between a row of workman's houses on the one side and the manager's and the foreman's houses on the other, these buildings occupying the space between the high road and the main building. "On the right of the entrance road, there is a building which is being fitted up as a recreation room for the use of the employees, next to which is the store room, for oils, paints etc. The entrance road then leads right direct between the main, or manufacturing portion of the factory, and a large building of three floors used as general stores. This latter building is plainly shown on the illustration above, and covers a ground area of some 135 by 45 feet. This roadway, dividing the two buildings, continues through to the private gardens surrounding the residence of Mr Cundall, and also affords ready access for carts to all the different departments of the works, which cover a floor space of 35000 square feet, exclusive of the quadrangle or courtyard, round which the buildings are erected and occupied, as shown in the ground plan above." "As will be seen, the end of the rear section, which is two floors high, is occupied as a coach house and stables, the whole of the remainder of the section being taken up by the foundry. At right angles to the foundry we have the fettling shop, over which are the foundry stores, and then the forge, and across the court-yard there is fitted a crane by which heavy castings can be rapidly transmitted to the large room on the opposite side of the courtyard, where the planing, drilling, boring, grinding and other machines of the most up-to-date British and American makes, are all ready to do their share in the transforming of the rough casting to the finished machine. This room, which has a floor space of some 100 by 40 feet is the ground floor of the front of the building as seen in the photograph, and is excellently adapted for the purpose, the floor being as rigid as though it were on the solid ground; in fact, this remark applies to every floor in the building which is of very unusual strength." 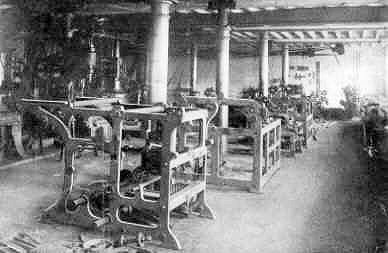 "The first floor of this section is occupied by the erecting and fitting shops, and the tape making, French polishing and carpenters' shops, so that there is no loss of time in passing the various parts of the machine from one department to another, special attention having been paid to the economic production by saving of unnecessary haulage. The top floor is where the patterns of the various machines made by the company are kept and is admirably adapted for this purpose, the ventilation and other requirements being all that can be desired. "Descending to the basement, we find a well ordered array of small castings, spindles, and other similar parts, so that any part or parts required can be at once drawn upon and removed with every facility to the machine, erecting or fitting shop. At the northern end of this block and in immediate connection with the erecting and fitting shop, whence the goods are carried by a travelling crane, is the delivery wharf, on the right of which is the engine room, the gas making plant and the electric lighting plant. The gas making plant provides the power for the "Cundall" gas engine of 35 b.h.p., which in its turn drives the various machines and the electric generating plant." "At the north-east corner of the main building is to be found the general offices, draftsmen's rooms and private offices, all equally well appointed as the other parts of these up-to-date works. "Although the works have been established but little over twelve months, it is astonishing the progress which has been made and the constant necessity for increasing the output which is required, owing to the numerous orders received by Mr Cundall since the establishment of the new firm. This steady increase is without doubt due to the fact that Mr Cundall lays himself out to produce machines to meet the requirements of his customers instead of simply making a machine and endeavouring to force it on the trade without regard to the necessities of their particular work, which varies in almost every establishment." "At the present time there are some fifty hands constantly employed, and there is room for two other fifties to be accommodated should the exigencies of the trade demand such a large staff, which, in view of the go-a-head business methods adopted by Mr Cundall and the sterling value of the machines turned out by him,is not by any means a unlikely result, and that in the near future. "Notwithstanding foreign competition, the Cundall machines have always held their own, and their superior merits have been recognised both in this country and overseas. More especially is this so in the case of machines specially built to meet the requisitions of foreign and Colonial makers; many large firms abroad have these machines running, and have sent repeat orders for them,which sufficiently demonstrate their eminently satisfactory qualities. To be able to successfully compete with strong foreign competition of this nature surely constitutes one of the most convincing arguments, one of the very best testimonials in favour of these machines...."
"There are many other machines, each deserving of special mention, but we think we have shown sufficient to impress upon our readers the fact that, confining their attention as we have mentioned, solely to the production of folding machines, the Cundall Folding Machine Company, can produce anything required in this class of machine of a quality and at a price which favourably competes with any make on the market. "In conclusion, we may say that the works, being conveniently placed within easy reach of the Royston and the Shepreth stations on the Great Northern Railway and the Lords Bridge and the Old North Road stations of the London and North Western Railway, there can be little delay in the conveyance of machines to any part, a fact which can only be appreciated by those who have experienced the disappointment of the slow conveyance from towns where traffic is great and has a habit of getting blocked sometimes for days together." In the 1901 Census for 'New Orwell', there were thirty-six local men, women and children living in rented tied accommodation tied to the brewery complex with the retired Meyer brothers (still in residence in 'Oatlands') as their landlords. Of the tenants, some of the household 'heads' were employed as agricultural labourers on the Meyer's farms, some were domestic gardeners on the 'Oatlands' estate, and others looked after the Meyer's horses. One cottage contained a small village shop. Of the thirty-six individuals listed in 1901, thirty-three (92%) were born within the Croydon-Arrington-Wimpole-Orwell axis and only three (8%) were born further afield. In 1908, William Denton Cundall leased the whole estate to convert the old brewery building into a factory. The rented cottages were required for his employees, some of whom would be transferring from the family business in Shipley, Yorkshire. So, with one exception (Mrs Rayner and her village shop), the 'Meyer tenants' were given notice. Nine local families had to find other accommodation. The 1911 Census for 'New Orwell' lists thirty-five men, women and children in the rented accommodation linked to the new factory with (presumably) leaseholder William Denton Cundall as their landlord. Of the new tenants, most of the household 'heads' were employed as engineers, fitters and carpenters, and one was a book-keeper. Of the thirty-five individuals listed in 1911, twenty-six (72%) were born in Yorkshire (I include two Orwell-born infants to Yorkshire-born parents and one British subject born in America but working in Yorkshire), only five (14%) were born within the Croydon-Arrington-Wimpole-Orwell axis, and four (14%) were born further afield. 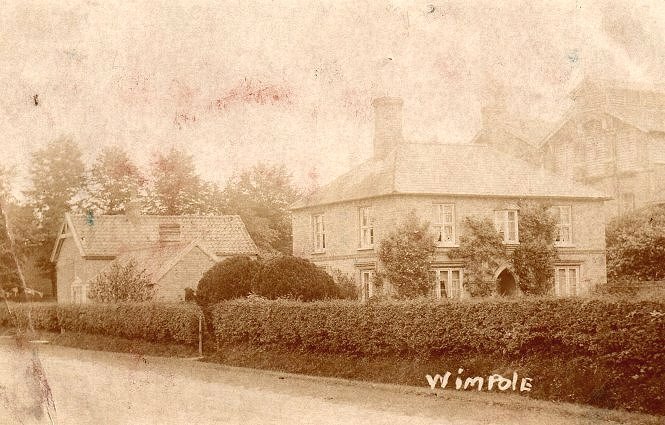 Six of the Yorkshire children would have attended Wimpole's C of E School across the road ***. The Cundall household adds a further four individuals born in Yorkshire but they have not been included in the above figures. It is possible that the 'Heads' of some the Yorkshire families feature in the c1912 photograph and the two 1915/1916 photographs below. Some of the wives may also feature in the three 1915/1916 'war work' photographs below. 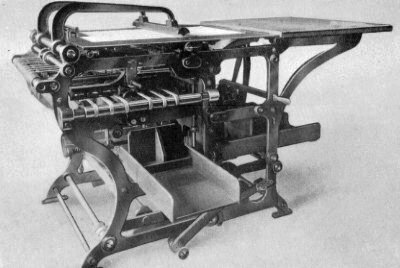 I can't confirm the exact date but it is believed Cundall's Folding Machine Company had ceased manufacturing in 'New Orwell' by June of 1917 when the factory building was sold to Charles Townley. The business was re-established in Luton, Bedfordshire. The 1922 Auction prospectus lists the seven cottage tenants as "Sims, Pigg, Rayner, Parnell, Ward, Wenham and Simson" so the Yorkshire families had all moved on. Employees outside the main factory entrance. (1) Wimpole-born Edward Skinner is in the middle row, third from the right. (2) (a) An Orwell men listed in the 1911 Census might feature in the above image - Frederick Giddings described as an 'iron foundary employee', who lived with his father Ebenezer Giddings in the High Street. He survived WW1 and is listed under "those who served" on the Roll of Honour in Orwell Parish Church. (b) also possibly included is 'a son' of Ellis and Eliza Miller, described in the Census as 'a fitter at the Cundell Folding Machine Co'. (3) The bowler-hatted individual is presumably owner William Denton Cundall. Please let me know if you can provide names to any of the people in these photographs. 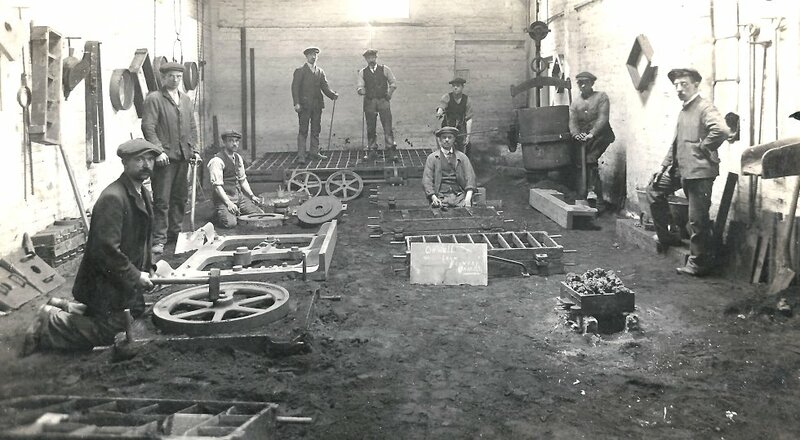 Foundry workers casting frames in sand for Cundall's Folding Machines. (1) Wimpole-born Edward Skinner is second from the left and there appears to be face and clothing matches with the 1915/1916 image below. Would the manufacturing of paper folding machinery count as protected priority war work? (3) Images (B) to (F) inclusive were all taken on the same day. 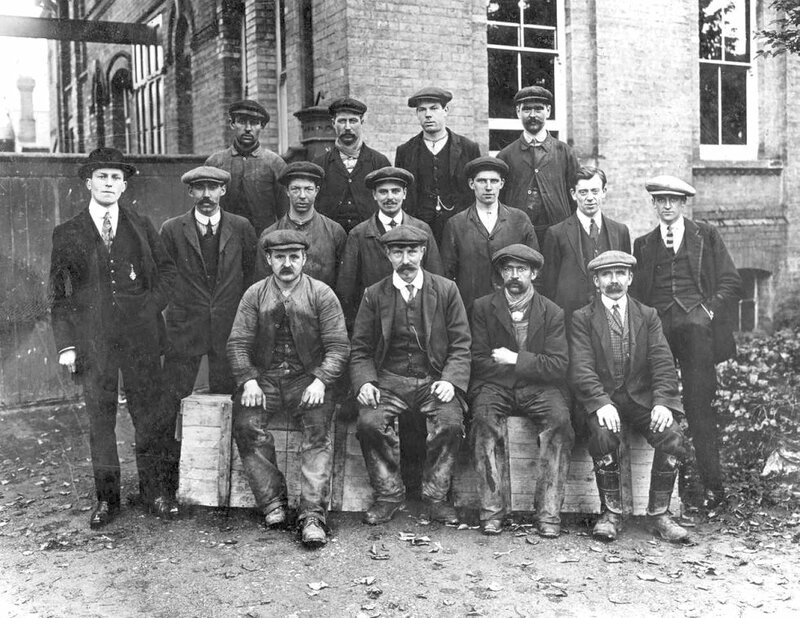 Cundall's employees outside the main factory entrance. The image appears to have been cropped on the right-hand side. The photograph dates to between September 1915 and early 1916 (and the location was just 60 feet from my back door...). (1) David Miller has identified the girl as Orwell's Florence Rosetta Bareham (née Freestone) who was born in Orwell on the 6 October 1894. She is wearing a wedding ring which is significant in dating images B to F on this page. Please visit Cundall Employees 1915 for details of Florence's surprising life. Apart from everything else that happened, she is officially one of the world's longest-lived women. (2) Wimpole-born Edward Skinner is in the back row, second from the left. He worked for Cundall's until he joined the Sussex Regiment on October 5th 1914. The following summer (August 1915) Edward was sent home from the army to aid urgent war work at 'Cundall's Munitions Works'. He was recalled by his regiment and sent back to France on 6 July the following year and killed in action at the Somme just four weeks later. I don't wish to make light of the circumstances, but yes, Florence's wedding ring and Edward could have appeared in the same photograph together but only in the window between September 1915 and June 1916. As Florence gave birth to a son in July 1916, I would suggest the first six months of this time span is the more likely. (3) (a) An Orwell men listed in the 1911 Census might feature in the above image - Frederick Giddings described as an 'iron foundary employee', who lived with his father Ebenezer Giddings in the High Street. He survived WW1 and is listed under "those who served" on the Roll of Honour in Orwell Parish Church. (b) also possibly included is 'a son' of Ellis and Eliza Miller, described in the Census as 'a fitter at the Cundell Folding Machine Co'. (4) The bowler-hatted gentleman is presumably owner William Denton Cundall. (5) Images (B) to (F) inclusive were all taken on the same day. Photograph courtesy of Brenda and Michael Skinner (2002). 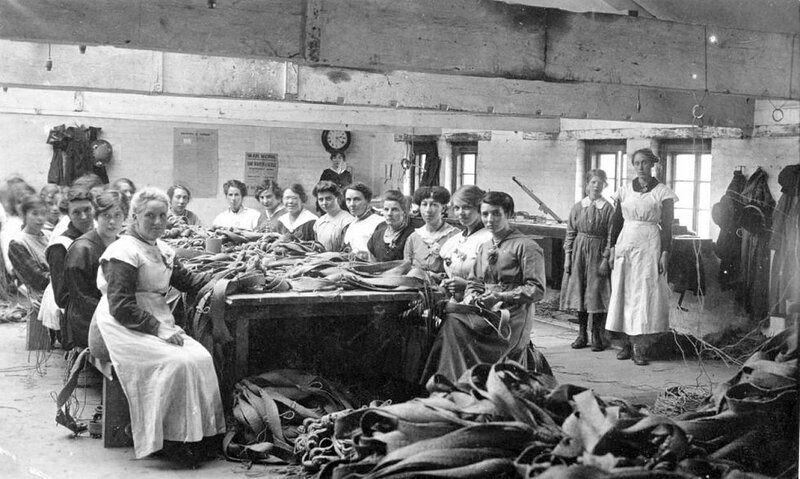 Women Workers employed on Government controlled War Work at 'Cundall's Munition Works'. They are sewing harnesses and webbing items for military use. The photograph dates to between September 1915 and early 1916. See also (E) and (F) below, which were clearly taken on the same day. Women workers employed on Government controlled war work at 'Cundall's Munition Works' They are holding examples of their work. This photograph was taken in the garden of the Manager's House 'Rose Villa', now No 39 Cambridge Road. The photograph dates to between September 1915 and early 1916. See also photographs (D) and (F), which were clearly taken on the same day. 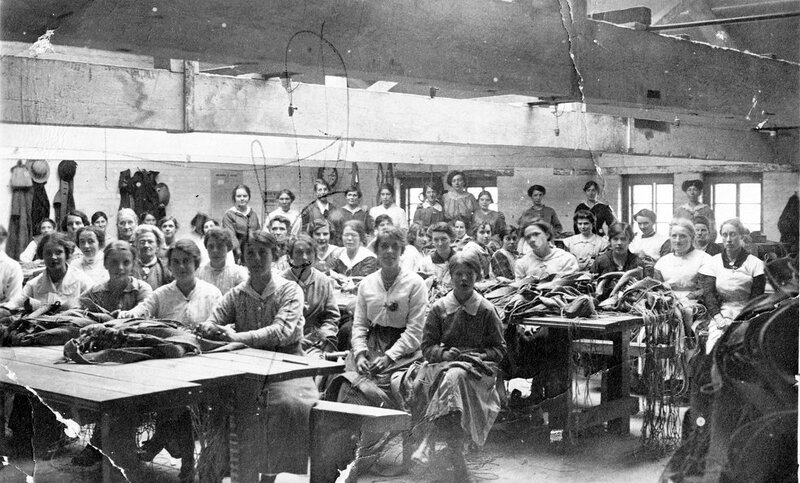 Women Workers employed on Government controlled War Work at 'Cundall's Munition Works'. They are sewing harnesses and webbing items for military use. The photograph dates to between September 1915 and early 1916. See also (D) and (E) above, which were clearly taken on the same day.